Some days, you just know, will stick in your memory. Or maybe not the whole day, just snapshots from it. You can take as many pictures as you like but you know that if you close your eyes you will be right back in the moment, every sensation as vivid as it is now. So, anyway, I reckoned this would be an adventure. Due to us being gas-guzzling, spoiled-rotten car users, my kids can probably count on one hand how often they’ve been on a bus. I was SO right. Daniel loved it, Emily chafed a little by the end of the hour’s journey at being strapped into her pushchair but she was as good as gold really. So what could have been a total nightmare (2 small children on a bus for an hour… my blood runs cold at the thought of what could have been) was delightful. 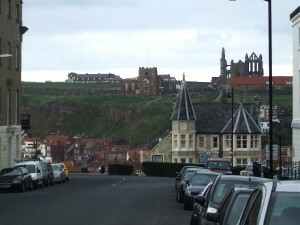 We wandered down to the sea afterwards, seeing parts of Whitby I hadn’t seen before but will again. We got a snack from a chip shop and sat and ate it by the water and watched the swing bridge let a couple of racing boats through. Eventually we got the bus home and again the children were near angelic. One of the happiest days I have had in a very long while. And on the bus on the way home I looked at my beautiful children and just knew. This was a memory day. Just love it when everything falls into place and makes for a special day and great memories. Very happy to hear that you’ve had just such a day today. Oh, we must appreciate these days. And your children deserve praise for helping to make this a wonder day for you. I know exactly what you mean. Some days are just perfect. And you’re so lucky to meet twitter friends in real life and hit it off!